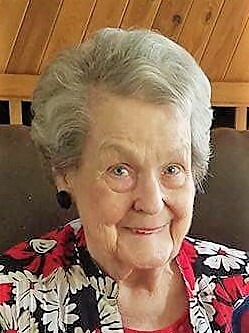 Rita Joyce Ward (nee Thompson), passed away January 19. Joyce was born November 14, 1929 to Alfred and Mary (Rigney) Thompson. Beloved wife of the late Ray Ward. Loving mother to Diane (Bryan) Winter, Ray (Cheryl), Sharon (Don) Kubica, Mary Catherine “Kate” Woods, Linda Joyce “Joy” (Leo) Foertsch and Carol Ann. Proud grandma to Brendan (Megan) Winter, Ryan and Kristi Ward, Donna Kubica, Dana Woods, Tricia, Linda (Mike Thornton), Anna and Leo Foertsch. Great Grandma to Berend Winter, Jon Rus and Jackson Christie. Cherished sister of the late June (late Lewis) Murphy, Alfred Joseph (Carol) Thompson, Theodore (late Roberta) Rapcaz, and Marion (late Francis) Rapcaz. Dear aunt to many nieces and nephews. Joyce and Ray worked many years side by side running Ward’s Nursery, formerly in Glendale Heights. Visitation will be Friday, January 25, 3 – 8 PM at Leonard Memorial Home (565 Duane Street, Glen Ellyn). Funeral Mass will be Saturday, January 26 at 10 AM at St. James the Apostle Catholic Church (480 S Park Blvd, Glen Ellyn). Interment to follow at Mount Carmel Cemetery in Hillside. In lieu of flowers, we request that donations be made to St. Jude Research Hospital.